Australian company, SASGAR FIRE AND RESCUE, has delivered a Rosenbauer SLF 4000/2250 HRET 8×8 heavy pumper – which Sasgar describes as one of the most powerful extinguishing firefighting vehicles in Australia – to Santos, the Australian oil and gas exploration company. It is in operation at Santos’s Moomba plant in the Cooper Basin in South Australia. The new Santos vehicle is designed to deal with the most hazardous emergency situations with the capacity to deliver 15,000 litres of water and 4,000 litres of foam in less than two minutes. Other impressive operating features that improve firefighter safety include the remotely controlled RM 60 foam/water roof monitor that can discharge up to 6,000 litres a minute and reach an extinguishing range using foam of up to 90 metres. The monitor has a movement range of 180° in both the horizontal and vertical directions, and the nozzle has an infinite stream adjustment from straight to spray stream. The monitor on the Santos vehicle has the ChemCore option to provide a concentric powder stream in the water stream, greatly improving the throw range for dry chemical powder. The powder is delivered to the nozzle through a telescoping pipe with minimum friction loss and is insensitive to clogging. A Rosenbauer Stinger High Reach Extendable Turret (HRET) can reach a vertical height of 20 metres, a straight stream throw of 65 metres and discharge up to 4,900 litres a minute, providing extensive fire coverage. The movement range of the Stinger boom, turret and piercing tool covers all required attack positions. The horizontal rotation of the HRET is a total of 60°-30° left and 30° right – without the need for outriggers. 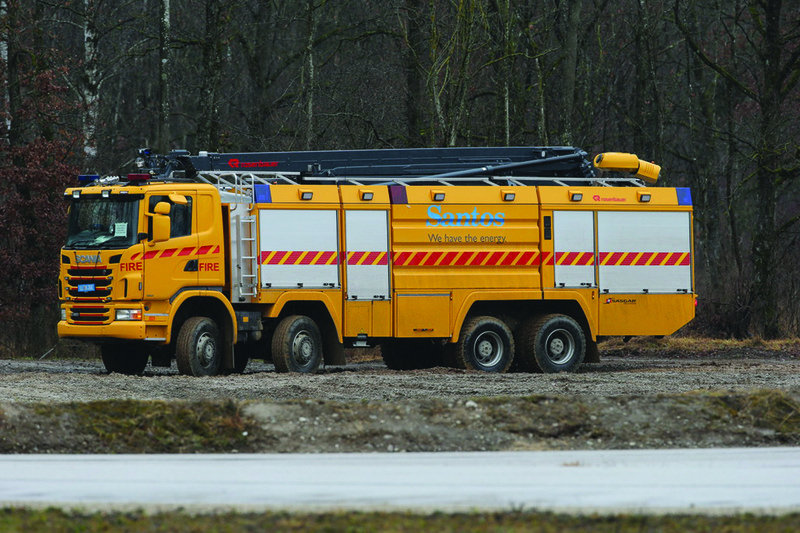 The vehicle is equipped with a Rosenbauer N100 single-stage, normal-pressure pump that has high water discharge rates of up to 15,400 litres a minute. There are eight 65 mm outlets and two 125 mm outlets on each side of the vehicle. The Santos vehicle is also fitted with LED scene lighting, wireless camera display on the HRET, rear-view camera with colour monitor, and the Rosenbauer “Service 4 Fire” vehicle management system. This enables remote system diagnostics, automatic notifications about the vehicle’s condition, and automatic detailed reports on vehicle systems along with many other features. This year, Sasgar has also delivered four new Rosenbauer Panther aviation firefighting vehicles to Auckland Airport Emergency Services in New Zealand, and two new Rosenbauer Panther VO 6×6 ARFF vehicles to the Wellington Airport Fire Service.